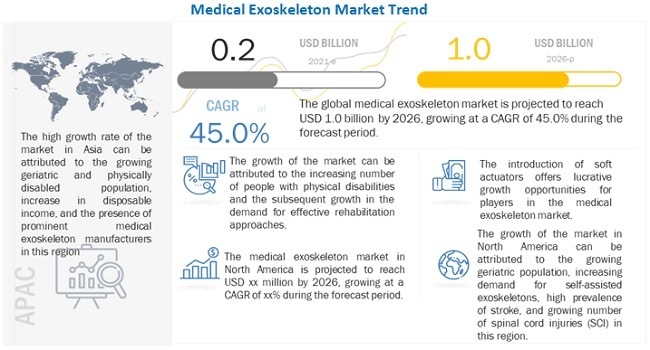 [116 Pages Report] The medical exoskeleton market is projected to reach USD 571.6 million by 2023 from USD 85.7 million in 2017, at a CAGR of 37.4% during the forecast period. The base year considered for the study is 2017 and the forecast period is from 2018 to 2023. Globally, the number of people with physical disabilities is increasing majorly due to the rising geriatric population, increasing number of road accidents and severe trauma injuries, and increasing prevalence of stroke, among other factors. According to the US Census Bureau, the global elderly population is estimated to increase at a steady pace in the coming years, from 900.9 million in 2015 to 1,402.4 million by 2030, and 2,092.0 million by 2050. All major regions across the globe are witnessing a significant growth in their geriatric populations, and this trend is expected to continue in the coming years. With the rising geriatric population, the number of people with disabilities is increasing as the elderly are more prone to conditions such as stoke and severe musculoskeletal injuries resulting from falls. The significant growth in the geriatric population thus not only indicates the presence of more potential users for medical exoskeletons but also implies that there would be a lesser number of active people to look after the elderly and disabled in the coming years. As a result, the demand for effective rehabilitation approaches, including the use of new and advanced technologies and products, is increasing across the globe. 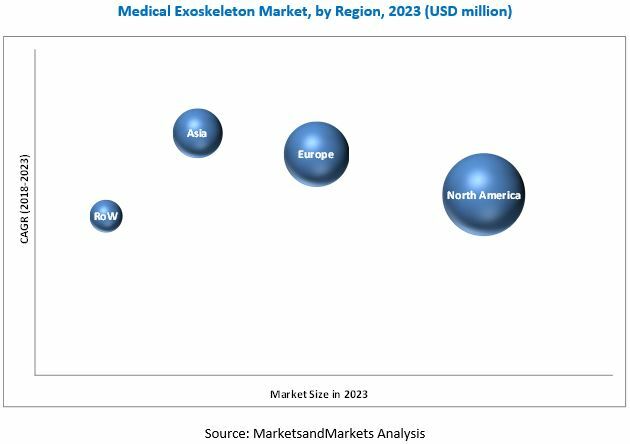 This is considered as a positive indicator for the growth of the medical exoskeleton market in all major regions. Assistive devices are an essential part of healthcare. In several countries, many rehabilitation centers use assistive devices provided by government organizations, special agencies, insurance companies, and charitable and non-governmental organizations. Currently, coverage for the exoskeleton technology by insurance companies is low in several countries. However, companies are focusing on framing policies and entering into strategic collaborations and agreements with various public and private insurance providers for the reimbursement of medical exoskeleton devices. For instance, Ekso Bionics is approaching the Centers for Medicare and Medicaid Services and third-party insurers as they are expected to play an important role in the long-term commercial adoption of the Ekso GT device. Similarly, in June 2018, the ReWalk Personal 6.0 Exoskeleton System was included in the official list of medical aids (Hilfsmittelverzeichnis) by the German National Association of Statutory Health Insurance Funds (GKV-Spitzenverband), making the device officially recognized as a medical aid (according to §33 SGB V) throughout Germany. Also, in November 2017, Germany's national social accident insurance provider Deutsche Gesetzliche Unfallversicherung (DGUV) approved the rental of the ReWalk Personal exoskeleton system for qualifying beneficiaries. Such initiatives by manufacturers and insurance providers will create potential growth opportunities for the medical exoskeleton market. The study estimates the medical exoskeleton market size for 2018 and projects its demand till 2023. In the primary research process, various sources from both the demand side and supply side were interviewed to obtain qualitative and quantitative information for the report. Primary sources from the demand side include various industry CEOs, vice presidents, marketing directors, technology and innovation directors, and related key executives from the various players in the medical exoskeleton market. For the market estimation process, both top-down and bottom-up approaches were used to estimate and validate the market size of the medical exoskeleton market as well as to estimate the market size of various other dependent submarkets. Also, the study took into account the data shared by various associations and organizations such International Federation for Robotics (IFR), American Stroke Association (ASA), The International Journal of Robotics Research and Robotics Industries Association. All possible parameters that affect the market covered in this research study have been accounted for, viewed in extensive detail, verified through primary research, and analyzed to get the final quantitative and qualitative data. This data was consolidated and added to detailed inputs and analysis from MarketsandMarkets and presented in this report. The medical exoskeleton market includes various players. Key players in this market include The major players in the market are Ekso Bionics Holdings, Inc. (US), ReWalk Robotics Ltd (Israel), Parker Hannifin Corp (US), Bionik Laboratories Corp (Canada), CYBERDYNE Inc. (Japan), Rex Bionics Ltd. (UK), B-TEMIA Inc. (Canada), Hocoma AG (A Subsidiary of DIH Technologies) (Switzerland), Wearable Robotics SRL (Italy), Gogoa Mobility Robots SL (Spain), and ExoAtlet, O.O.O. (Russia). Parker Hannifin received approval for Indego from the Department of Veteran Affairs (US). This will help the company to further expand its market in the US. Hocoma merged with DIH International to provide a total solution for modern rehabilitation. The company established “Villa Beretta” Centro di Riabilitazione, in Costa Masnaga (LC), Italy, as the first Center of Robotic Excellence in Europe. Ekso Bionics established its new regional headquarters in Freiburg, Germany, aiming to strengthen its European presence. The global medical exoskeleton market is projected to reach USD 571.6 million by 2023 from USD 116.7 million in 2018, at a CAGR of 37.4% during the forecast period. Factors such as the increasing number of people with physical disabilities and subsequent growth in the demand for effective rehabilitation approaches and increasing insurance coverage for medical exoskeletons in several countries are driving the growth of the medical exoskeleton market. The report segments the market into component, type, mobility, extremity, and region. By extremity, the market is segmented into lower extremity medical exoskeletons and upper extremity medical exoskeletons. The upper extremity segment is projected to grow at the highest CAGR during the forecast period. These exoskeletons are generally used in the rehabilitation of upper limb amputees and stroke and cerebral palsy patients. The medical exoskeleton market is segmented on the basis of component, into hardware and software. The hardware segment is estimated to account for the largest market share in 2018. The large share of this segment can be attributed to the fact that a large number of parts such as sensors, actuators, power sources, and control systems are required to manufacture exoskeletons. Manufacturers are also adding upgraded and advanced hardware into the overall design to enhance the capability of medical exoskeletons, making them smarter and more interactive. The medical exoskeleton market is segmented by type into powered and passive exoskeletons. In 2018, the powered exoskeleton segment is expected to dominate the market. This segment is also expected to grow at the highest CAGR during the forecast period. The presence of sensors and various controlling functions in powered exoskeletons to sense motion, tilt, and speed is the major factor driving the growth of powered medical exoskeletons. The market is dominated by North America, followed by Europe. Factors such the growing geriatric population, increasing demand for self-assist exoskeletons, high prevalence of stroke, and the growing number of spinal cord injuries (SCI) are driving market growth in this region. However, the high cost of medical exoskeletons may restrain the growth of the market to a certain extent. Ekso Bionics Holdings, Inc. (US), ReWalk Robotics Ltd (Israel), Parker Hannifin Corp (US), Bionik Laboratories Corp (Canada), CYBERDYNE Inc. (Japan), Rex Bionics Ltd. (UK), B-TEMIA Inc. (Canada), Hocoma AG (A Subsidiary of DIH Technologies) (Switzerland), Wearable Robotics SRL (Italy), Gogoa Mobility Robots SL (Spain), and ExoAtlet, O.O.O. (Russia)) are the key players operating in this market.